On the freeway (Bundesautobahn) Potsdam-Berlin take the exit no. 2 - Hüttenweg. Follow Hüttenweg in the direction to the city centre just up to its end (about 3 km). There, turn right into Gelfertstraße, and then take the second turn to the right, Kehler Weg. At the next crossing, turn left, cross the underground train bridge and follow Brümmerstraße. Faradayweg ist the first turn on the right. Follow the street for about 200 m; the entrance to the institute is opposite the park. Take the S-Bahn train S45 in the direction of Westend. Get off at Heidelberger Platz and change to the underground line U3 in the direction of Krumme Lanke. 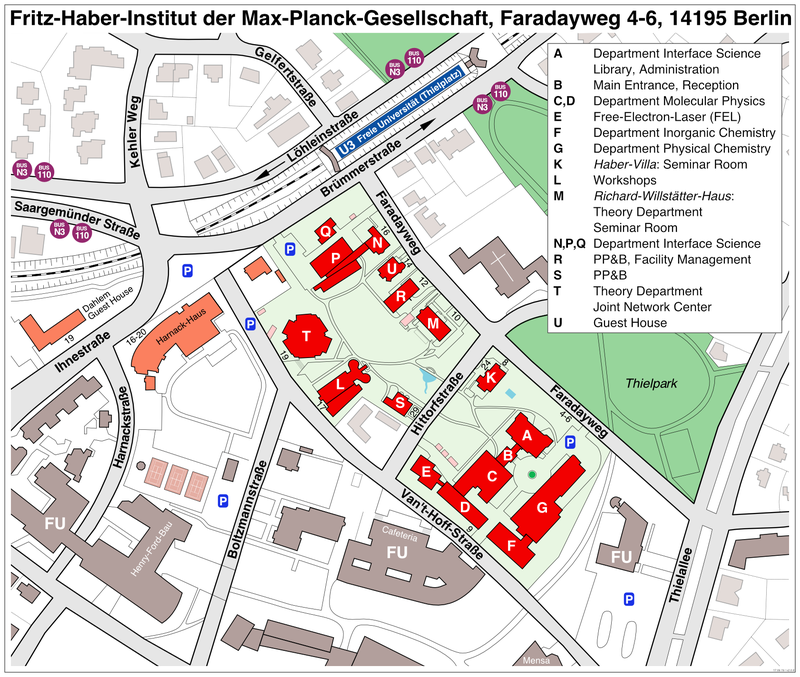 Get off at Freie Universität (Thielplatz) and take the exit Faradayweg. Turn left and cross the street at the traffic light. Turn right into Faradayweg and follow it for about 200 m; the entrance to the institute is opposite the park. The travel takes between 45 and 60 minutes. The ticket costs 2.70 EUR. A taxi from Schönefeld travels about 45 minutes outside the rush hour and costs about 45 EUR. Take any S-Bahn train going West to the direction of Zoologischer Garten (S5, S7, or S9). There, take the underground (U-Bahn) U9 in the direction of Rathaus Steglitz. Change at Spichernstrasse. Take the U3 train in the direction of Krumme Lanke. Get off at Freie Universität (Thielplatz) and take the exit Faradayweg. Turn left and cross the street at the traffic light. Turn right into Faradayweg and follow it for about 200 m; the entrance to the institute is opposite the park. The travel takes about 35 min. Tickets cost 2.70 EUR. A taxi takes about 20 minutes outside the rush hour. It costs about 30 EUR. Take either train S41,S45 or S46 in the direction Westend and get of at the station S- and U-Bahnhof Heidelberger Platz. Change into the subway U3 in the direction of the station Krumme Lanke and get of at the station Freie Universität (Thielplatz). It is a five minute walk from there. Please see the map. The train is about 25 minutes and costs are 2.70 Euro. A taxi ride takes about 15 miutes and will cost approx. 20 Euro. For all trips described here, a ticket for the fare zones AB is sufficient. Before you start your trip, do not forget to stamp your ticket using the red or yellow boxes installed on the platforms. This also applies if you buy a day ticket.